As a child growing up in our family we read a lot, however, Dr. Seuss books weren’t a regular in our library. Instead, I gained an appreciation for his writings as an adult early in my career. From that, you may think my early career was in children’s education, but I have actually been working in business since the beginning. 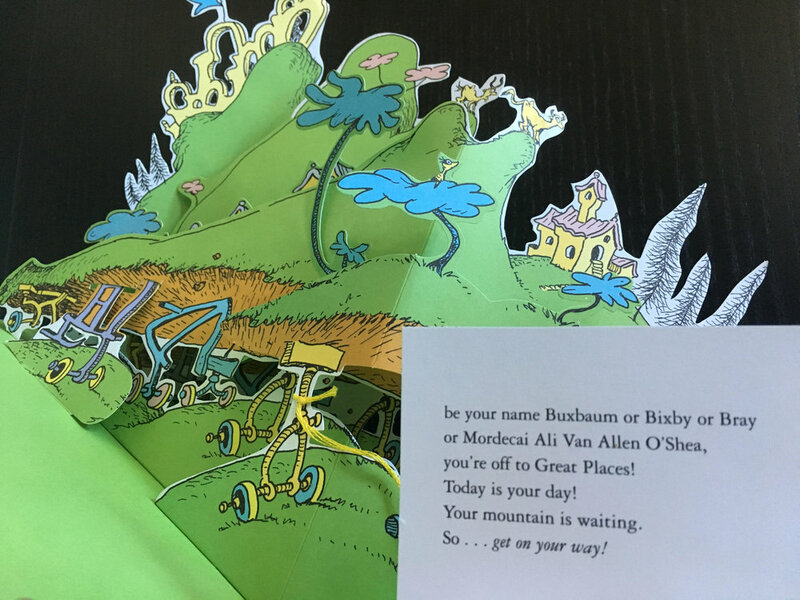 The book that got my attention was Oh, the Places You’ll Go! I was part of a campus recruitment team and we gave a copy of it to all new recruits. But where it really captured my imagination was as a gift from my boss as our project finished and our contracts were over. She gave me a pop-up version that beautifully animated the journey. “You can get so confused that you’ll start in to race… headed, I fear, toward a most useless place. The waiting place… for people just waiting. As intra/entrepreneurs, there may be good times and better times to pursue the next idea, but waiting around for a perfect time does you no good. There is always more research or more analysis that can be done. Instead, get out into the marketplace to directly sell to customers and get iterative feedback. Those first few steps can be scary and every negative comment can personally sting but now you actually know what people think of your product or service rather than just waiting to find out. A challenge many have is actually having too many ideas, rather than not enough. How can you possibly make up your mind on which amazing idea to work on next? This is where a vision board, idea notebook and business plan come in. An idea notebook keeps track of all those ideas rather than forget them or fret that you will forget them. This could be a physical notebook, an email to yourself or a tool like Trello or Evernote. A business plan can chart out the next 3-24 months for you, rather than leaving you feeling you need to get every idea implemented all at once. The lead-up to that quote: 98.75% of the time you’ll succeed, which for any one idea or project likely isn’t the case. However, for someone who is persistent in pursuing their pinnacle by a variety of paths then, yes, you will have success in the end. This persistence is a key differentiator between the wanna-be entrepreneurs and those that actually create new marketable innovations in their organizations. Do a lil’ self-care and enhance your personal profile. It’ll be a creative spark, a ‘preneurial boost, or both, it just may.